PRINCETON, NJ; June 28, 2017 — On Wednesday, May 24, Young Audiences New Jersey & Eastern Pennsylvania (YA), the area’s largest arts education non-profit, honored artists, colleagues, and funders alongside students at the 37th annual Governor’s Awards in Arts Education. The Prestigious Governor’s Awards are co-sponsored by the New Jersey Arts Education Partnership and the New Jersey Department of Education. 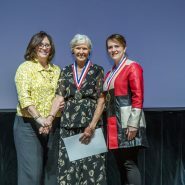 Young Audiences’ Distinguished Arts Leaders awardees included YA Trustee Liz Fillo, teaching artist Marilyn Keating, D.A. Graham on behalf of the Trenton Board of Education, and Jeffrey Vega on behalf of The Princeton Area Community Foundation. 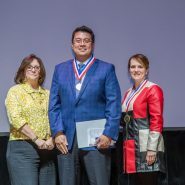 Jeffrey Vega receiving a Young Audiences’ Distinguished Arts Leaders Governor’s Award on behalf of The Princeton Area Community Foundation. “We are honored to receive the NJ Governor’s Arts in Education Philanthropy Award,” said Jeffrey M. Vega, President & CEO, who accepted the award on behalf of the Princeton Area Community Foundation. “We want to create communities where all children thrive, and the arts play a vital role in enriching young lives. We are happy to support programs like Young Audiences, which provides all children with opportunities to experience the arts. “I think it’s vitally important that the state acknowledges those who bring the arts to the children of New Jersey, creating better citizens for tomorrow. And I feel privileged to be one of those so acknowledged,” shared Young Audiences Trustee Liz Fillo. 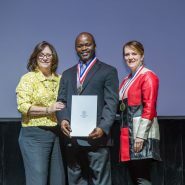 The Governor’s Awards in Arts Education began in 1980 to promote awareness and appreciation of the arts, recognizing the creativity, talent and leadership of the award winners. 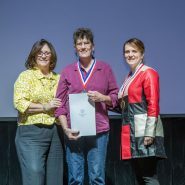 Each year, awards are presented to approximately 20 educators and 80 students. National and statewide organizations select the students for their exemplary work in creative writing, speech, dance, music, theatre and visual arts and the leaders for their exceptional commitment and contribution to arts education. The program also recognizes arts educators and arts education advocates, whose leadership has helped nurture the development of students in the arts across the state. Young Audiences Trustee Liz Fillo receiving a Young Audiences’ Distinguished Arts Leaders Governor’s Award. The Governor’s Awards event is a partnership of the New Jersey Arts Education Partnership, the Department of Education, Art Pride New Jersey Foundation, the Department of State and the New Jersey State Council on the Arts. Additional support is provided by: the Afro-Academic, Cultural, Technological and Scientific Olympics; Art Educators of New Jersey; Art Administrators of New Jersey; Dance New Jersey; New Jersey Council of Teachers of English; New Jersey Forensic League; New Jersey Music Educators Association; New Jersey Performing Arts Center; Playwrights Theatre of New Jersey; Speech and Theatre Association of New Jersey; VSA New Jersey and Young Audiences New Jersey & Eastern Pennsylvania. The cooperating organizations, award sponsors and individual members of the planning council dedicate their time to make sure that excellence in the arts is rewarded, and work tirelessly throughout the year to plan this special event. The Governor’s Awards in Arts Education ceremony are a major collaborative effort of the arts, education and state government.